What do you want as an author? What can you share that your audience desires, and what will you receive in return? Engagement develops from finding the common ground, the similar interests and the mutual needs between you and your readers. This shouldn’t be difficult, forced or phoney–but real and genuine. So strive to include this simple premise of engagement in your efforts to build your writer platform. Commit to your readers not only by developing yourself as a writer, but by sharing the most important and relevant parts of your growth with them. Ensure that those that should be aware of your work, are. Listen to–and acknowledge–their compliments, criticisms and interpretations. Include your readers in the process of your artistic expression, and let them share the journey with you. If you do this well, you will never have to ‘sell’ another book. A candid article on the ‘reality’ of book marketing and promotion from Sean’s–and probably many other authors’–perspective. This article is a fantastic example of what can happen when you think outside the box and use your book’s themes, characters or their lifestyle to make unorthodox–but valuable–marketing tie-ins. Frustrated with your social media results? Try this article by Jason, which shows us a few quick fixes to removing obstacles that may be standing in the way of our social media brilliance. Relevant reviews are uber important for gaining attention for your book, so finding ways to get these endorsements and assessments of your work is critical. In his article, Chris outlines 10 resources, aside from Amazon, to get reader reviews. If you’re busy marketing you have no time to write, right? And a marketing superstar is irrelevant if there is nothing to promote. So how can you manage to squeeze in both? Rachel gives us some pointers. Beginner or not, these blogging insights from those who have gone before–and succeeded–are invaluable. Jody shares 3 big tips to strategically planning your free book giveaways, as opposed to just sharing with the masses. Who wouldn’t want a top bloggers cheat sheet on the steps they take to promote their highly shared posts? Count me in! Read the article to see if you can incorporate some of Ana’s tricks to get more love and ‘kapow’ from your posts. Instead of feeling guilty and stressed about the challenges of getting enough done with your writing career this summer, follow Christina’s advice and take a breather to recharge your batteries. Shannon discusses how good research, combined with your special sauce and lots of marketing, may increase your chances of creating a financially successful writing career. When do you get your best ideas? Find out how you can generate and harness more of these gems by checking out this post from Caleb. I’ve been wanting to get Scrivener for awhile, but hesitated because I wasn’t sure if I wanted to add another item to my long list of ‘to learn’. After reading this post, I must say, I think it would be worth my while. What do you think? Watch this video interview that Joanna does with Evo Terra (author, podcaster and digital business strategist) to find out more on why you should ‘bother’ with Google+. Is fear ‘murdering your writing dreams’? Farnoosh reveals 5 excuses that are killing your writing potential. Get better results by customizing and targeting your press releases. This article includes ideas and resources on how to do it. 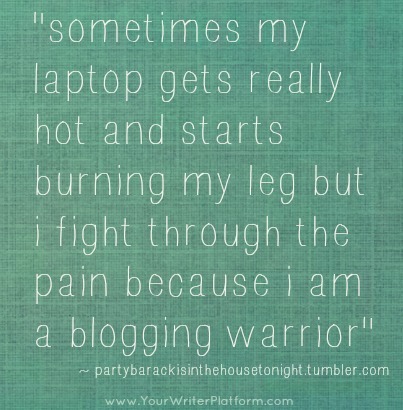 Here’s some inspiration for both new and seasoned author bloggers. It’s one of those quotes that makes you accidentally spit coffee on your friend or giggle uncontrollably every time it pops back into your head (at least that was my experience 🙂 ). 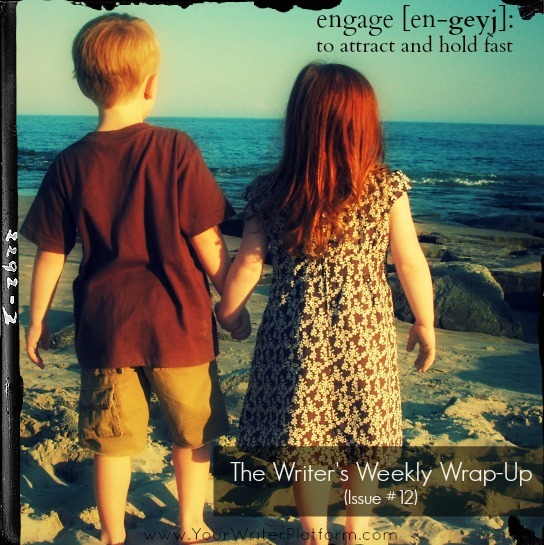 Want to make sure you don’t miss the Weekly Wrap-Ups or other great articles on platform building and book marketing? Sign up to stay in touch and to get all the latest from YWP. BTW: Are you on Google + ? Thanks for the compliments, CJ! Fantastic round-up as usual, Kimberley; thanks for featuring on of my posts as well!